Protective membrane paint which provides a protective matte finish. Complete and uniform coverage must be provided over the various substrates, and can be achieved generally with a sealer coat and two top coats of Unitex Uni-PTC. Can be coloured to match your desired decorative shade (in light-fast colours). These flexible protective topcoats are designed to provide a rainproof pigmented surface sealer. Minimum two coats are required which not only protect the surface from aggressive environments but also enhance the beauty of the finished construction. The Unitex Protective Top Coat can be painted over the decorative Unitex Uni-Shape® Architectural Profiles and Columns so that the same colour continues over the entire wall or you can select a colour that highlights the effect of the Unitex Uni-Shape® Architectural Profiles and Columns. There are two grades in the Protective Membrane. Unitex Uni-PTC protective membrane leaves a matt surface finish effect, which is generally applied in two coats to provide a thicker water-resistant coloured paint. The Unitex Uni-Flex Membrane is recommended for all environments but essential for marine area applications, where it leaves a satin surface effect with low water vapour permeability. Again best protection is achieved with two coats. 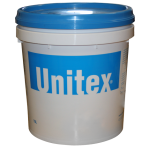 Both Unitex Protective Membranes have excellent durability due to the high flexibility built into the products. They are based around acrylic polymer dispersion binders combined with synthetic extender, surface additives and very fine graded quality fillers. The pigmentation is completely integrated during the manufacturing process, which means colour through the entire film thickness. Applied Finishes are available in a wide range of full colour to pastel shades. Please contact Unitex for the full range of colours available. Note: Some deep tones cannot be supplied in applied finishes. Contact Unitex for your specific solution. All colours will fade to some degree with time in exterior systems. Each pail has a label with the unique code identifying the particular texture type, colour and batch number. This coding ensures that if you require additional product (say to finish off a job), Unitex can closely match the texture and colour to the original. The pails have a strong sealed lid to prevent spillage if they should tip over before opening. Even after opening the lid still fits tightly enough when re-sealing to prevent contamination of the remaining product. A minimum of 72 hours, under ideal temperate conditions, is required for through-dry (and cure) of the render, when the surface is thoroughly dry the Unitex Textured Finish coat may be applied. Dry is measured to be less than 12% WME (Wood Moisture Equivalent) where measured on a Protimeter® Moisture Meter. The substrate must be clean before applying the Finish coat. Any crumbling, loose or damaged substrate render must be removed and the surface patched and made good prior to coating. All surfaces must be free of grease, oils, dirt and dust. Pre-painted surfaces must have flaking paint wire brushed back to a sound substrate. Unitex recommends a base coat of a pigmented Unitex Uni-Substrate Sealer (2 coats) over old renders prior to application of the surface finishes. All Unitex Protective Membranes are designed to overcoat Unitex Applied Finishes or directly to the decorative Uni-Shape® Mouldings. SiteUnitex strongly advises prior sign off by your builder / architect, on all coating systems. Always provide the Builder and Designer with a site texture sample of minimum 2m², finish and colour for written approval nominating the Unitex specified system.